Thes One Dj Set @ Tres Night! Check it out!!! Anyone in the LA area should come to this event. Gona be a great night for an extremely worthy cause. Ohmega Watts Djin as well. I'll be there for sure so if you spot an english dude in an FTC cap and probably a Fun Dmc hoodie then come say wassup!! plus Ohmega Watts! Dope - support this! Just a reminder that this is going on tomorrow night! FREE ENTRY. Who's coming through?? 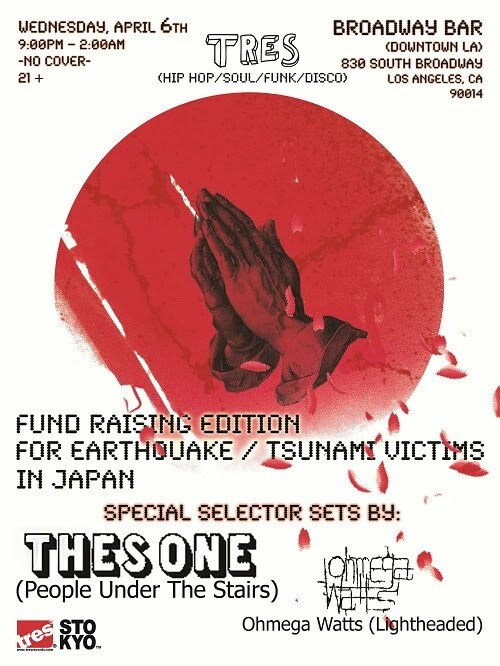 And just another friendly reminder that ALL proceeds will go to Red Cross to help earthquake victims in Japan. There's also going to be merchandise available from Piecelock 70, Tres, Stokyo, Ubiquity and Pop Killer! Ahhh....i am sooo gutted i cannot attend.....not only are Thes and Ohmega playing but its all for a good cause....Damn the fact i live in the UK....damn it!!! !